Mr. Wilson (gray) teaching lessons to both horse and human. Everyone needs a good teacher. Even those brave souls who ride racehorses on a daily basis needed to start somewhere and hone their craft. The same goes for horses, who before they achieved greatness going full-tilt, often learned how to jog and gallop around a training track alongside a reliable partner. Through setting good examples and keeping a cool head, that “equine teacher” helped them find their confidence and competitive edge. For a lucky group, both horse and human, Mr. Wilson was their teacher. Bred by Matthew Firestone and sold for $150,000 at the 2000 Fasig-Tipton Selected Yearling Sale in Saratoga, the then-dapple gray raced 15 times as Mouthadasouth before being given away as he was cooling out after a disappointing finish in his final start. 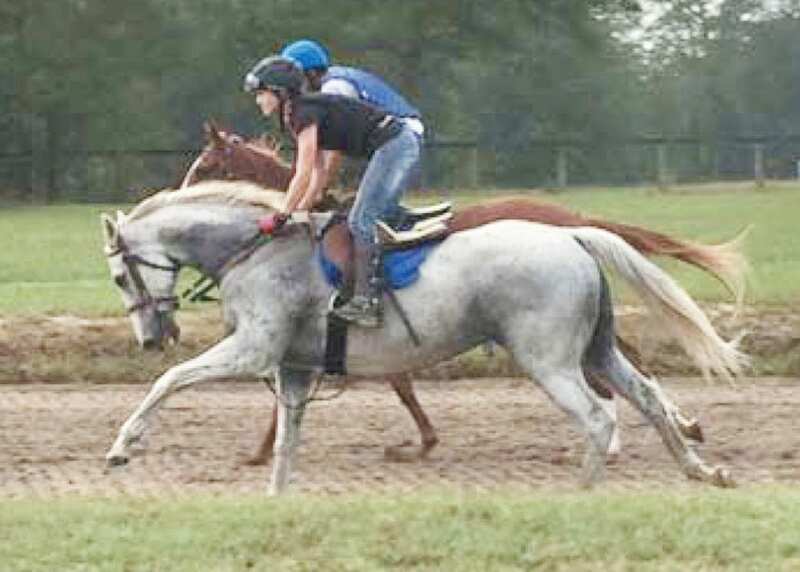 “He had rocket speed but had a wind problem and was running in the 4-1/2-furlong races at Charles Town and was given to a friend of mind in the receiving barn, which is how we got him,” said Helen Richards, a former jockey and wife of Kirkwood Stables owner Kip Elser. “To say he has an attitude is an understatement. He wants things to be done his way, and if they’re not he is quite the grouch. That’s how he got his nickname, “Mr. Wilson,” from the character on Dennis the Menace. The couple sent their new horse to Tom Gilliland, who at the time was the head outrider in New York, to be trained as a lead pony. Once they got him back, they quickly learned how valuable of a team member for Kirkwood he would become. Based in Camden, S.C., Kirkwood Stables is a multifaceted operation, offering training and conditioning of yearlings and 2-year-olds, as well as layup and rehabilitation for horses of racing age. It was earlier this year at the Fasig-Tipton Gulfstream select two-year-olds in training sale that Elser’s consignment made headlines when he announced that the five horses entered under the Kirkwood Stables banner would be galloping rather than breezing during the breeze show. At an operation like Kirkwood, most people have to wear multiple hats. For a horse like Mr. Wilson, it means wearing multiple saddles.“With a Western saddle he is the perfect pleasure horse. He never picks up the bit, loves trail riding and doesn’t have a spook in him. Throw an exercise saddle on him and a D-bit and Mr. Wilson takes quite a hold,” said Richards. Mr. Wilson goes out with every set of young horses, galloping with them in company the first few days to provide an example for them to follow, and keeping them in line when they misbehave. He’s also the test that any Kirkwood rider has to take before they’re allowed to be legged up onto one of the racehorses. At 19 years old, Mr. Wilson is still going strong, putting in more miles on a daily and weekly basis than any of his pupils in training and letting riders know when they’re ready to hop aboard a fit racehorse… and when they’re not.